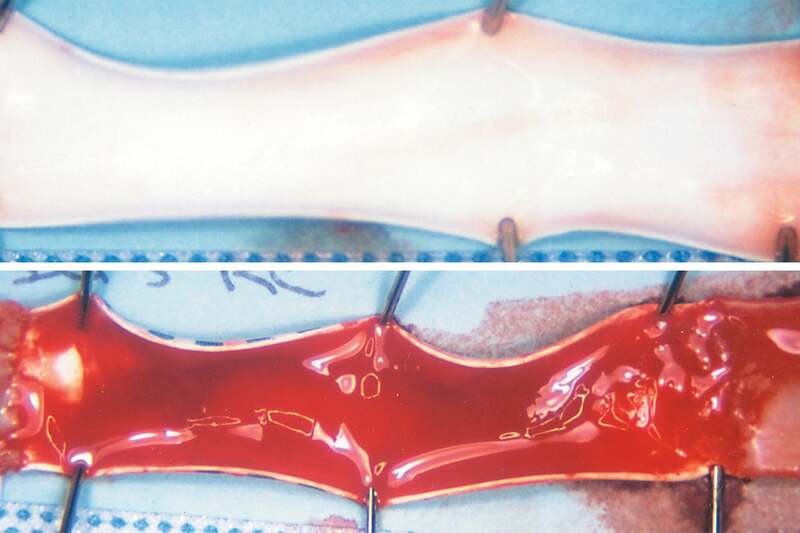 The BioActive luminal surface of a 3 mm diameter GORE® PROPATEN® Vascular Graft (top) remains free of thrombus, while the non-bioactive surface of a control graft (below; 3 mm diameter) is covered with thrombus. Grafts were explanted after 2 hours in a challenging carotid shunt canine model. The GORE® PROPATEN® Vascular Graft has demonstrated improved thromboresistance and patency compared to standard ePTFE grafts in pre-clinical in vivo tests. A randomized, multi-center clinical study has shown promising results.2 The thromboresistant surface technology employed on the GORE® PROPATEN® Vascular Graft is designed to maintain bioactivity, thus increasing the potential for performance improvement and increased patency*. *Long-term data are not available regarding improved patency compared to marketed grafts. Gore's innovative solutions are designed for treating complex peripheral disease and backed by dedicated service to help improve patient outcomes. Begovac PC, Thomson RC, Fisher JL, Hughson A, Gällhagen A. Improvements in GORE-TEX® Vascular Graft performance by Carmeda® bioactive surface heparin immobilization.European Journal of Vascular & Endovascular Surgery 2003;25(5):432-437. Lindholt JS, Gottschalksen B, Johannesen N, et al. The Scandinavian Propaten® Trial – 1-year patency of PTFE vascular prostheses with heparin-bonded luminal surfaces compared to ordinary pure PTFE vascular prostheses – a randomised clinical controlled multi-centre trial. European Journal of Vascular & Endovascular Surgery 2011;41(5):668-673.